Hi all, my brother received a PCN through the post for an alleged contravention of ignoring a no right turn sign. 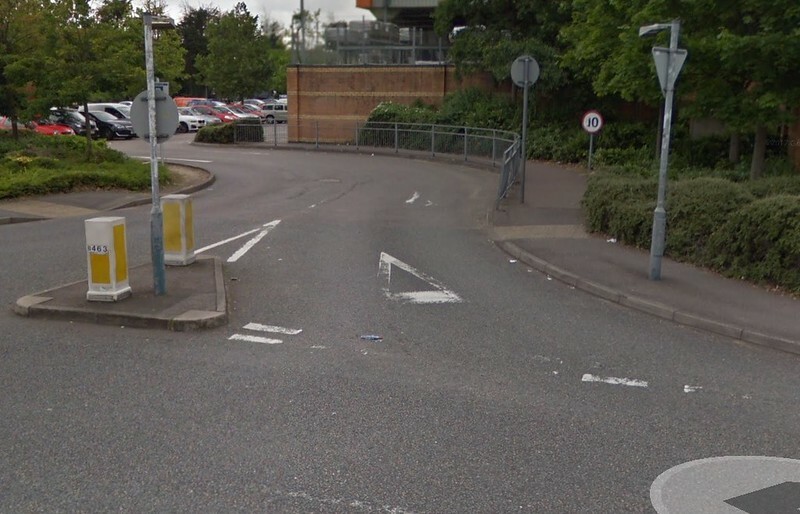 The no right turn is apparently at Tangent Link for customers coming out of B&Q in Harold Hill. He did not notice any signs but on revisiting he now noticed that there is one there. Are there any grounds to challenge this as a simple mistake on what looks like a private road shouldn't really result in a £65 fine in my opinion. Mr Hollis attended today. He is the partner of Miss Allan the registered keeper of the car. Mr Hollis has made the written representations in this case. At the hearing today Mr Hollis referred me to a decision of Adjudicator Edward Houghton in the case of Kelly appeal number 2150440632. The Adjudicator allowed Mr Kelly’s appeal on the basis that he was not satisfied that the vehicle had made a prohibited right turn. The Traffic Management Order prohibits vehicles from turning right into the loading area opposite the Romford United Reformed Church Building. The CCTV footage shows the appellants car marking a U turn in the area at the entrance to the loading area. I find that it is not clear from the footage that the car leaves Western Road and enters the loading area. I am not satisfied on the evidence that I have seen that the contravention occurred.  In its case summary the local authority states that the Penalty Charge Notice does comply with the legislation. I am not satisfied that it does. Although the Penalty Charge Notice offers a more generous timetable than prescribed by the legislation I am not satisfied that the Penalty Charge Notice in this case did comply with the requirements of the London Local Authorities Act 2003. PMB, thank you so much! So in the example you've provided, does that mean that if Havering have not stated that a reduced by 50% is not included and just say £65 is payable if within 14 days then it is not compliant? EDIT: The 50% line has been crudely added to their letter now. PMB, thank you so much! So in the example you've provided, does that mean that if Havering have not stated that a reduced by 50% is not included and just say £65 is payable if within 14 days then it is not compliant? No the regs only allow 14 days so by telling you 21 you could go to pay on day 21 and find they want the full amount. Ahhhhh! Ok great, I'll stick that in my appeal too. Thanks so much. Following links may (or may not) help you. Do please let us know how you get on. Briefly The Gazette notice 03/03/17 adding the prohibition to this area, and a FOI link re the number of fines issued in the last 5 years (0 until 2017 then 1133 by 09/10/17 and no doubt a lot more since then. I know this location, and it's a very odd restriction. 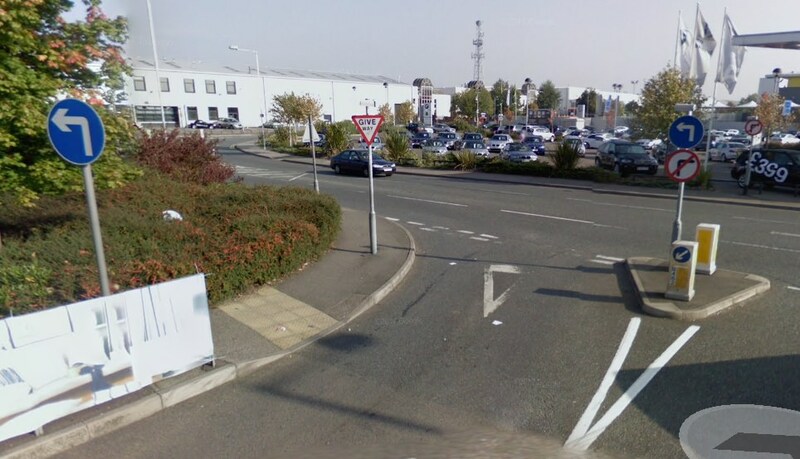 The council want motorists to go left for a few yards, then do a u-turn at a roundabout and double back on themselves, ending up exactly where they would have been if they had turned right. I'm not sure if the pointlessness of the restriction has any relevance, but perhaps it opens up the question of how far left you are required to go before performing the allowed u-turn? All the way to the roundabout? One inch? So there's a quandary with the signs, Its a no right turn prohibition so the white circle with red boarder and diagonal with the black arrow diagram 612 this one is correct. But the blue circle 609 ones aren't. they convey essentially the same message but cannot be used to enforce a TMO. Will the one 612 be enough? and will the 609 cause confusion. There's two 612 signs, and the 612 and 609 signs convey the same message, so I think there is little scope for confusion. I suspect an adjudicator would take the view that the signage conveys what is required of the motorist and I would not suggest appealing on the signage. It is an odd restriction, but we don't know the reasons for it. Unless one wanted to argue that the decision to make the restriction is irrational and that no reasonable authority would have created the restriction, the fact that it is odd does not help. I suspect the 14/21 day issue on the PCN is the only valid ground to appeal. There is a similar restriction and layout here in Crewe. It is the entrance to a Bannatyne gymnasium, and also has a roundabout just a few yards up the road. Do you think I should just pay up then? Don't like the way the red sign is lower than the blue sign in the photo at post 2 and I would have expected a road marking with an arrow pointing left. The appellant raised an issue concerning service of the penalty notices and their total amounts. I therefore checked the penalty notices for their amounts and dates of issue. The penalty notices in this case were issued under Section 6 of the London Local Authorities and Transport for London Act 2003. The local authority is entitled to issue the penalty notice to the person appearing to them to be the owner of the vehicle concerned. 9 specify the form in which such representations are made. I found that each penalty notice in this case states that the full penalty must be paid not later than the last day of the period of 28 days beginning with the date on which this penalty notice is served; and the reduced rate no later than 21 days from the date of service. The wording is clearly wrong. To such an extent, I find the notices are invalid. I will therefore allow the appeal. Think the signage has changed a bit from the one I posted - it was from 2008. Her's a view from the other side, June 2017. Looks like one of the turn left signs has gone and maybe both and there are now 3 no rights in total (inc one opposite). But is 21 days not right given 2008 CCTV regs which may override the 2003 regs? "Regulations brought in during 2008 mean you can get a ticket through the post in England and Wales if caught on CCTV. This makes it more difficult to gather evidence for an appeal because the 'contravention' would have taken place days before. The only plus is, if caught on CCTV, you've 21 days to pay at the reduced rate, instead of the usual 14."